Is there not a cause? Such a pondering question. Yesterday I found myself asking this very one. A friend brought to my attention an ad that ran in the Arkansas Democrat-Gazette last Friday. 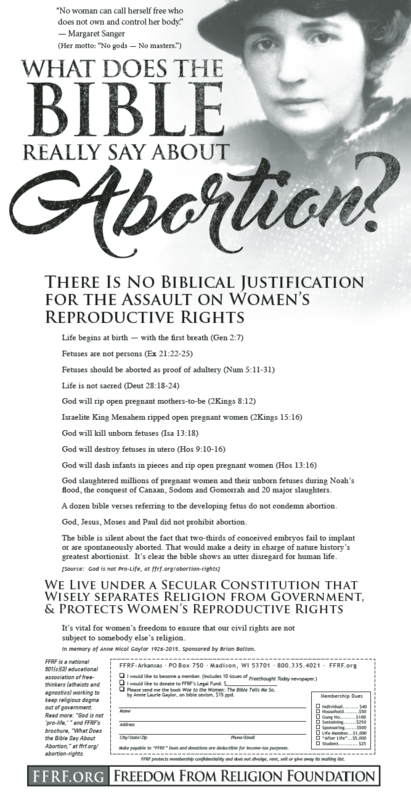 The full-page advertisement (see here) placed by the Freedom From Religion Foundation asked, “What Does The Bible Really Say about Abortion?” As I read the ad David’s question burned within me. Just who is this organization that they should defy the Living God? Mockingly, they declare that the Bible does not condemn abortion and even “shows an utter disregard for human life”. Using text out of context, they twist scripture in the same vile fashion as Satan did when he tempted Jesus in the wilderness. It always strikes me funny when people who claim there is no God, try and use His Word to prove their points. But the Bible speaks to this when it says in 1 Corinthians 2:14 that a person without the Spirit does not accept the things that come from the Spirit of God but considers them foolishness. The secular man cannot understand the things of God because the things of God are only discerned through the Spirit of God. But nevertheless, they try. Using Genesis 2:7 they say that life does not begin at conception, but rather when a person starts breathing. “The LORD God formed man of the dust of the ground, and breathed into his nostrils the breath of life; and man became a living soul.” It goes without saying that Adam’s beginning was unique to mankind. The first woman was created just as unique as she was taken from her husband’s rib. Both were fully formed adults at creation, not babies in the womb. The ad tried to prove from the Bible that fetuses are not persons. Again, more twisting of scripture. Repeatedly the Bible refers to pregnant women as being “with child.” Job, the oldest book in the Bible, refers to unborn children as infants. The Psalmists declares, “For thou hast possessed my reins: thou hast covered me in my mother’s womb. I will praise thee; for I am fearfully and wonderfully made,” (Psalm 139:13-14). God tells the Prophet Jeremiah, “Before I formed thee in the belly I knew thee; and before thou camest forth out of the womb I sanctified thee, and I ordained thee a prophet unto the nations.” The Apostle Paul says, “it pleased God, who separated me from my mother’s womb, and called me by his grace,” (Galatians 1:15). God is the giver of life. This life begins at conception. To take life through abortion is to murder the innocent. It doesn’t get any more innocent than an unborn child and it should be noted that “hands that shed innocent blood” is listed in Proverbs 6 as an abomination to God and a sin that He hates. Not only does the FFRF ad mock God and His Word, it deceives readers saying, “We live under a secular Constitution that wisely separates religion from government, and protects women’s reproductive rights.” There are three fallacies with this one statement. First, read the writings of the men who penned the Constitution. They were not secular. Most of these men were believers in Jesus Christ. They acknowledge this in Article 7 of the United States Constitution when they wrote, “Done in Convention by the Unanimous Consent of the States present the Seventeenth Day of September in the Year of our Lord…” Second, Thomas Jefferson’s “separation of church and state” phrase is not found in the Constitution but rather comes from a personal letter written to a group of Baptists. Third, the constitution does not give women a right to murder their children. However, before the Constitution was penned some of the same Founding Fathers did write about certain rights. “We hold these truths to be self-evident, that all men are created equal, that they are endowed by their Creator with certain unalienable Rights, that among these are Life, Liberty and the pursuit of Happiness.” These truths (absolute truths) are self-evident (undeniable and obvious) that our rights come from our Creator (Jesus Christ our Lord). These rights include Life, Liberty and the Pursuit of Happiness. Notice that life comes first. Freedom and happiness is of little value if there is no right to life. Let me ask again, is there not a cause? Christians, have we forgotten who we are? Have we lost the will to stand up against this massacre? Does not the slaying of millions move us to action? If so, pick up a stone of truth and whirl it at the giant of lies that is constantly mocking our God. Take a stand. Write a letter. Support a pro-life candidate. Labor in prayer. Give your time, treasure and talents. It is a worthy cause. Ahhh, yes, another Christian “apologetic” who conveniently picks and chooses what parts of the Bible they want to follow, and cries that people are “taking it out of context” when they are reminded of the evil parts they are ignoring. Only a simple minded fool would think that an atheist using the Bible is “funny” in an ironic way, completely missing the point that atheists are only pointing out how ridiculous it is for grown adults to actually believe in such Bronze Age superstitious nonsense, which is why they constantly point out the parts of the Bible that Christians conveniently ignore. In what “context” is it okay to smash a baby’s head against the rocks (as the Bible says). In what “context” do people live to be 700 years old? In what “context” does it make sense for two penguins to waddle all the way from Antarctica to get on a boat built by a man who hears voices in his head? In what “context” does it make sense that Adam and Eve, supposedly the first humans to exist, had a child who went off to ANOTHER CITY to find a wife? The list goes ON AND ON AND ON. The Bible is nothing more than a collection of Bronze Age mythology told by barbaric goat herders who believed in child slavery. And no, most of our Founding Fathers were NOT Christian, and NO, the Creator mentioned in the Declaration is NOT Jesus Christ. Think about it for a moment – the author of the Declaration of Independence was Thomas Jefferson, a Deist, who completely REJECTED Christianity and called it “the most perverse system that ever shone on man”. He also said that the virgin birth of Jesus was mythology, and would one day be taught alongside the myths of Jupiter and Minerva. Seriously, instead of spreading nonsense on the internet, go look it up. Why would a man who REJECTED the divinity of Jesus and the Bible think that Jesus was the creator? IT MAKES NO SENSE! Ben Franklin, Thomas Paine, John Adams, Alexander Hamilton, James Madison (the “Father of the Constitution” himself)….NONE OF THEM CHRISTIAN. These men were scholars of the Secular Enlightenment, a movement that appealed to logic and reason, and dismissed Christian superstition, and the notion of a god who intervened in humanity or performed miracles. They were spiritual men no doubt, but they did NOT believe in the divinity of Jesus or the Bible. Seriously, it’s no wonder Christians get mocked. You might as well have said our laws were based upon Russian law, or aliens. In fact, the VERY FIRST Amendment is LITERALLY THE EXACT OPPOSITE of the First Commandment. While the First Commandment demands the worship of only one god, our Founding Fathers decided that the VERY FIRST RIGHT that we had was the right to COMPLETELY IGNORE the First Commandment, and worship whoever we want, or no one at all. How “Christian” of them. HAHAHAHAHA!!!!!! You people continue to bury your head in the sand and live in your own fantasy world, don’t you?? We “people” simply see with spiritual eyes unlike those who have their minds blinded by the god of this world (2 Corinthians 4:4). But, thank you for stopping by and please stick around. Just perhaps God the Creator of All will open your eyes to His glorious truth. Blessings! Thank you for sharing this truth! The Bible is undeniably clear about murder and abortion is murder. Jesus says that there is a veil over the eyes of unbelievers where they cannot see the truth. I pray that their eyes will be unveiled to the truth and that God would soften their hardened hearts. Thank you Heather. That is my prayer. Blessings to you!